The Thompson Chain Reference Study Bible was developed by Methodist preacher Dr. Frank C. Thompson in the early 1900s, as the result of over 10 years of original research. He began researching in 1890, taking extensive notes in the margins of his Bible, grouping references by topic, and creating "chains" of topical references that could be followed all the way through the Bible. Members of his church saw his Bible and told him that notes like these would help them greatly in their personal Bible study. They encouraged Dr. Thompson to have his Bible, with marginal references, published so that everyone could have the advantage of these study tools. Since that time, Kirkbride Bible Company has added thousands of additional topics and links. 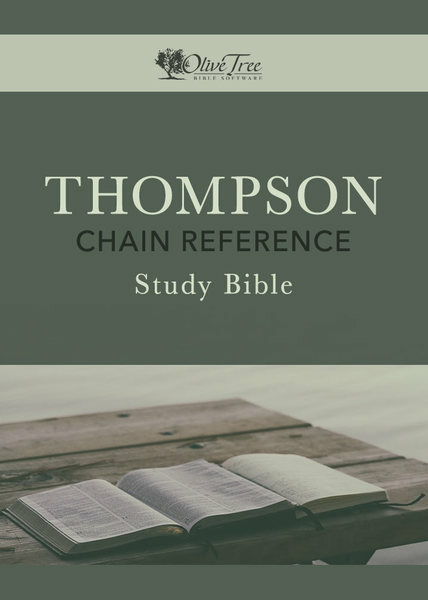 The Thompson Chain Reference Study Bible available today has over 100,000 links covering over 8,000 chain topics, allowing you to follow any subject, person, place or idea from the beginning of your Bible to the end. Added to the Olive Tree Bible App, the Thompson Chain Reference Study Bible works with any Bible translation in your library.